Are you seeking a career in Hotel Management, Tourism and Hospitality? Spend 3 weeks at our partner university in Shanghai and learn from the industry’s best! Immerse yourself in the cultural melting-pot that Shanghai Polytechnic University has to offer. You’ll learn the basics of Chinese cuisine, Chinese culture and diversity and you’ll gain an appreciation of China’s representative regional customs and etiquettes. Cost: 10,000 Yuan ($2,092 approx). The Study Abroad and Student Exchange programs are available to eligible Australian domestic students who wish to study at an overseas partner university for one trimester. Study Abroad students pay tuition fees directly to the host university and defer for one trimester at Torrens University Australia. Upon their return to Torrens, study abroad students receive Advance Standing for the units studied overseas. Torrens can use Fee-Help in order to pay for host university fees and the amount will be charged back to the student’s overall debt. Student Exchange students remain enrolled at Torrens University Australia during the trimester they spend studying overseas. Depending on the arrangement, exchange might require students to pay fees either at Torrens or at the exchange university. The Student Exchange program is not available at all partner universities. In this case you will need to apply for a Study Abroad program. There may be a limit on how many students may participate in a Student Exchange at a host university at one time. If this limit has already been reached you will need to apply for a Study Abroad program. We recommend you study elective subjects abroad. It is easier to gain course credit for elective subjects than core subjects. If you have already competed your elective subjects your Program Director will need to map one for one subjects for you. There is no guarantee that subjects selected will be available during the semester intake at any one given time at any of our partner institutions. Find out more about the courses available at our partner universities in 2018 and 2019. Academic Application Form – All students must apply through Torrens Student Mobility Office. Up to 3 students in one calendar year between January to December are able to study at NABA without paying host institution fees. These students remain enrolled at Torrens and pay fees to Torrens for their semester abroad. NABA’s dedicated housing office assists students in finding, securing and paying for accommodation through their third-party providers. More information can be found on their dedicated housing website. Students are required to apply for a Long-Term Italian National Visa to stay within Italy from 91 to 365 days. Note, the Schengen visa waiver is for those remaining in Italy up until 90 days. Students are required to book a visa appointment online via the consulate’s website and must attend the appointment in person. Hard-copy of bank statement showing transactions for the previous 30 days, with an AUD balance of at least €10,000 equivalent for a visa of 365 days, or a proportional amount if staying less (€27.39 per day for the exact duration of the student’s intended stay as specified on the Letter of Offer) The resulting amount is required with no exceptions even when all travel expenses have already been paid for. Students will NOT be granted an Italian student visa if they have not successfully provided the above information as specified. All requirements must be fulfilled, and all documents must be submitted in hard-copy upon applying for a visa at the interview. The Consulate will not accept email forwarding or electronic screenshots during the interview). Academic Application Form – ​All students must apply through Torrens Student Mobility Office. Students studying at IM will defer from studies at Torrens for the duration of their studies abroad and will pay local fees to IM. Istituto Marangoni will advise accommodation options for students before enrollment. Up to 6 students in one calendar year between January to December are able to study at UEM without paying host institution fees. These students remain enrolled at Torrens and pay fees to Torrens for their semester abroad. Universidad Europea de Madrid offers fully managed on-campus dorms for students. Information on student dorms can be found here. Up to 6 design students and 3 business students in one calendar year between January to December are able to study at University of Applied Sciences Europe without paying host institution fees. These students remain enrolled at Torrens and pay fees to Torrens for their semester abroad. University of Applied Sciences Europe will advise accommodation options for students before enrollment. Up to 6 design and business students in one calendar year between January to December are able to study at Pearl Academy without paying host institution fees. These students remain enrolled at Torrens and pay fees to Torrens for their semester abroad. Students studying at Stamford will defer from studies at Torrens for the duration of their studies abroad and will pay local fees to Stamford. Stamford arranges accommodation upon request through various third-party providers ranging from condominiums, apartments and townhouses. More information can be found here. Students studying at INTI will defer from studies at Torrens for the duration of their studies abroad and will pay local fees to INTI. INTI provides accommodation services to students through on-campus and third-party providers. More information can be accessed here. Academic Application Forms – All students must apply through the NewSchool online application form and notify the Torrens Student Mobility Office. Up to 6 design students in one calendar year between January to December are able to study at NewSchool without paying host institution fees. These students remain enrolled at Torrens and pay fees to Torrens for their semester abroad. On-campus accommodation is organized by NewSchool at an additional cost to the student through student apartments and student housing. Each host university has a different application form. Make sure you read the form correctly to ensure you meet all the requirements and have all the necessary documentation to lodge your application. Ensure you have at least 12 months’ validity on your passport before applying to study overseas. You will need to upload a scanned copy of your passport. All personal information is kept private and confidential. Design students must upload an up to date Curriculum Vitae (CV) and portfolio of work. Business, Hospitality and Health students are to upload a recent CV. Torrens University Australia offers Australian domestic students scholarships to study overseas through Australian Government Grants. Depending on the region, there can be five to 20 grants available to help students have a diverse study experience. New Colombo Plan (NCP): receive $5000 to study in Thailand and India. 20 places available in 2019. Applicable to Design, Business and Hospitality students. 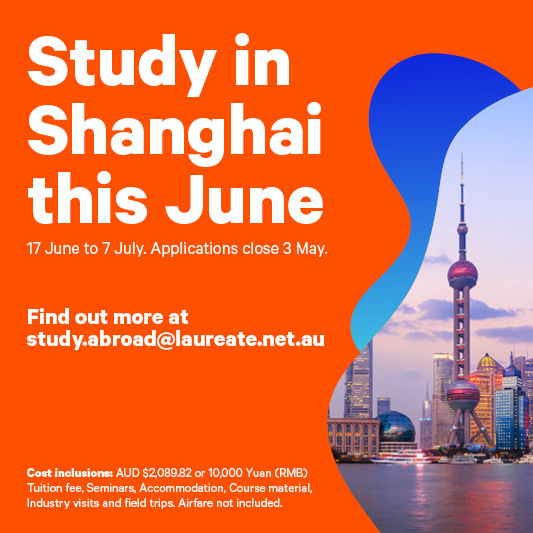 Torrens University Australia has partnered with CISaustralia to offer additional study abroad options at universities outside of the Laureate Network. Providing semester abroad experiences in the USA, Latin America, Africa, Europe and Asia for undergraduate students studying Business, Graphic Design and Media, Fashion Design and Architecture, Journalism, Communication, Public Relations and Marketing, and Health Sciences. Torrens works alongside CISaustralia to create a study abroad plan for individual students and we work with your Program Director to map appropriate subjects for you to gain credit towards your degree at Torrens. CISAustralia works with a range of world-renowned universities such as The University of California Los Angeles (UCLA), New York Institute of Technology (NYIT), University of Roehampton, London, Aix-en-Provence, France, The University of Victoria’s Gustavson School of Business, Canada, Dublin City University, Ireland, University of Economics, Czech Republic and Universidad Veritas, Costa Rica, to name a few. The price of study abroad programs through CISAustralia can range from $3000 to $9000, inclusive of accommodation, depending on the location and host university. CISAustralia will assess your application and will conduct a phone interview with you. Successful applications receive a dedicated Program Officer to assist you in your study abroad journey. An initial deposit of $500 applies to most study abroad programs; a deposit of $750 applies to applicants for US programs and a deposit of $2250 applies to multi-country program applicants. The deposit is not an extra fee; it is part of your overall study program fee. Applicants can refer to the Program Essentials document in their Portal for details on how to pay program fees. When the program deposit is received, you will receive access to a Participant Portal. CISaustralia will send you an official Program Confirmation via email as well as information on what is required prior to departure. When the Program Confirmation is received via email, you can make your travel arrangements. You will be required to make program payments in accordance with the CISaustralia Fees and Payment Policy and full payment of program fees is due 60 days prior to the program start date. Imagine receiving $5000 to help you study abroad for a trimester! Torrens University Australia has received Australian Government Grants through the New Colombo Plan, to foster and increase mobility to the Indo-Pacific Region. This is your opportunity to experience a new culture, make life-long friends and gain industry connections all while receiving credit towards your Torrens degree. Study a trimester abroad in Taiwan! Ten $5000 grants available for Chinese Medicine students to undertake Work Integrated Learning at Tzu Chi Teaching Hospital in Taiwan. Study a trimester abroad in Thailand! Ten $5000 grants available for Bachelor of Business, Bachelor of Commerce, Bachelor of Communication Design and Bachelor of Media Design students to study a trimester abroad at Stamford International University in Bangkok, Thailand. Why do you want to undertake the Study Abroad? Why did you choose the destination campus? What do you wish to achieve during this time? What extra steps will you take to ensure that you achieve your goals? How will you apply your experience to your future studies and career? Your application will be assessed by the academic and student mobility team and if you are successful you will be notified via email. To accept the grant, you must respond to the email. Participate in activities as a condition of the mobility program, including, but not limited to, activities at the host campus and assisting in the promotion of the University programs. Studying overseas allows you to expand your horizons, learn from a different culture, gain experience and make life-long friendships. While this is a life-changing experience it can also be a little daunting to begin with and Torrens wants to make sure you are prepared, ready and excited before you embark on your new adventure. "Countries outside of Australia are so different from anything here! You learn so much just by leaving the country and you learn so much more by living there! The opportunity is to learn things you cannot learn from google". "The best part about my experience has been the people I have met. Not only the local Thai people but also the other exchange students. I have met people from all over Europe and Asia and it has been so amazing! I now can say I have friends all over the world". "I wanted to add another level to my university experience. I wanted to gain a new perspective of the world and step out of my comfort zone and to be more independent, bold and mature. I believe overall, it's been a huge opportunity for personal growth and development".